Frozenbytes' Nine Parchments arrived on PC and the Nintendo Switch last week, so this past Monday Nick, Locke, Jason, and Mike teamed up to check out this spell-slinging adventure, and see how exactly it differs from Paradox's Magicka. While there may be some shared ideology between the two titles, there's a definite gulf of difference between Nine Parchments and Magicka. The latter was more focused on having players memorize certain key/button combinations in order to make use of their spells and really leaned hard into the chaos that comes with friendly-fire. 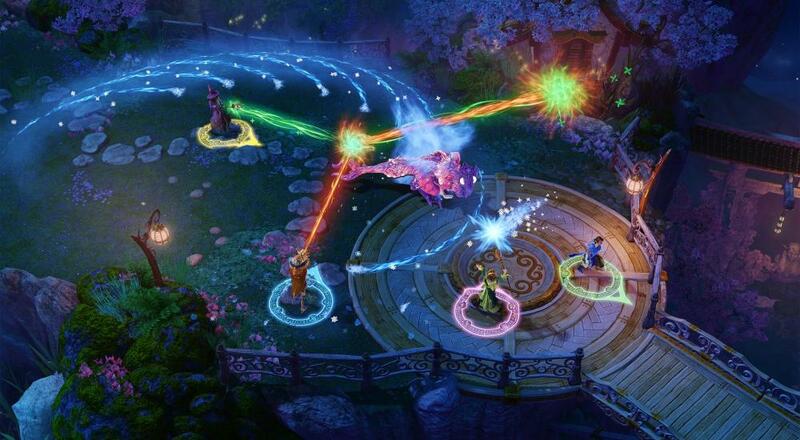 Nine Parchments, on the other hand, feels more like a twin-stick action RPG. There are a ton of unlockables in the form of purely cosmetic hats and game-affecting staves, and each of the nine playable characters (all but two have to be unlocked) offers something a little different. Marvik the Torrid, for instance, is the "fire mage" of the group and therefore starts with two different fire spells, whereas Carabel the Glacial focuses on ice and the mechanical Owl likes lightning. That's not even counting the different variants for each character that can be unlocked that have different initial spells. Each of these characters' respective skill trees complements their particular focus and offer some unique abilities to which only they (and their variant) have access and can use. As you progress through the game and defeat the handful of bosses, you'll unlock new spells to use, such as healing beams, shooting balls of lighting, and dropping death circles that do damage over time. Thus, there eventually tends to be a little overlap across the characters and what spells they use, but there are still some spells that are unique to each character and, again, their skill trees offer some unique ways to "spec out" your wizard. I try to say all of this during out play session Monday night, but then something happened for which I was wholly unprepared and my brain could never get back on track. So please enjoy this crazy recap. Nine Parchments is available now on PC, PlayStation 4, and Nintendo Switch. An Xbox One version is in the works, but no release date has been announced yet. The title supports four player online co-op, four player couch co-op, and combo co-op (i.e., a mix of online and couch) throughout the campaign. Page created in 0.9807 seconds.